Dyeing to try out my own HDT's...Hand Dyed Threads if there is anybody out there still not addicted to these! I have been asked if I am going to show the threads that I have dyed and what I am going to make with them, so here goes. I think that it's going to be a case of trial and error to find out the designs they suit. 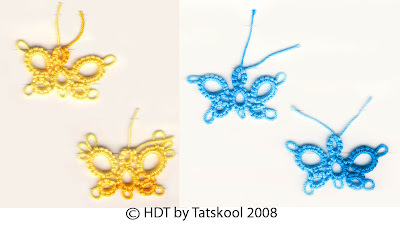 I already know that every HDT will make a stunning Gecko, but tatting isn't all about gecko's.......yes I do know that!! 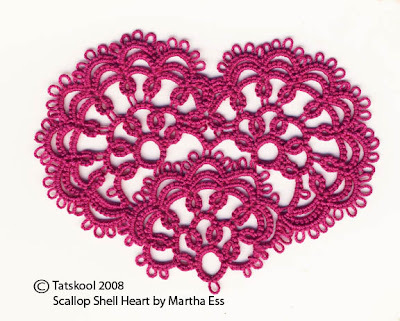 Decided that something frilly with lots of picots should work and so I decided upon Martha Ess's Scallop Shell Heart from her Book Tat Amore...the book that I discussed at length in previous posts. 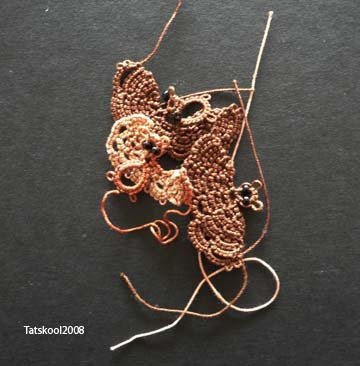 First try was in a Flora 20 thread that I have lots of, to work out how much thread it takes. I do my trial dye skeins in 15 meter lengths so that I can decide the ones I really like. It worked out perfectly within my 15m, but Oh those split chains with picots were a trial! I have avoided them before but now I have to master them. the one on the bottom right is pretty bad but I will get better. I want to include my mistakes as well as my successes to say...stick at it until you get it right! For every perfect piece published who knows how many not so perfect ones came before it. On to the HDT's..what colour to try. Here are a few of my first attempts at dyeing. I started using Dylon Cold Dye that was readily available but soon moved on to Procion MX as used by Yarnplayer and Lady Shuttlemakers the masters. Giving names to the colours is very evocative, I hope I haven't repeated anybody else's name, I don't want to compete with my masters in any way. 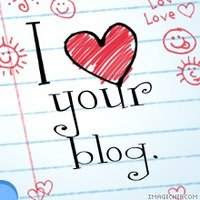 Yes I know that is an awful lot of work..nearly as much as preparing them for this blog!! But that is me and the novelty is bound to wear off!! Here are just 2 more threads that will concern us today. Back to the hearts at last, I made them in Rose Blush..oops massive mistake in there that I hadn't noticed until I blocked it...way too many small rings on the right side..now how did that escape my notice..must have been dazzled by the colours. This colour selection didn't work well at all for this I don't think. Next came Turquoise Delight, didn't like this much either..not a scallop colour. Butterbeer came next (Harry Potter fans will recognise my names..just as I imagined Butterbeer and Pumpkin Juice to look like). This one is perfect, finally got those split chains with picots licked! The final one at the bottom is a redyeing of Rose Blush dyed on a Flora 20 thread in a pale salmon colour...much less pink..but then got too clever and made major mistakes so had to reinvent the pattern as my version. No such thing as a mistake just a new pattern!! 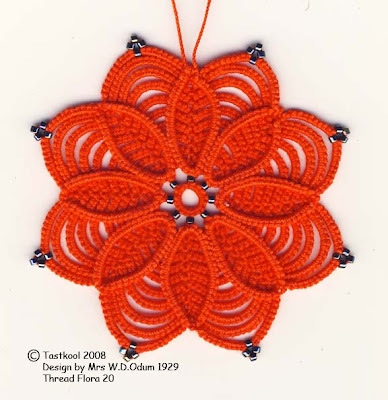 My thoughts on HDT with this pattern were that the heart looked better in the solid colour thread as the design is so clever that varig threads takes from it. 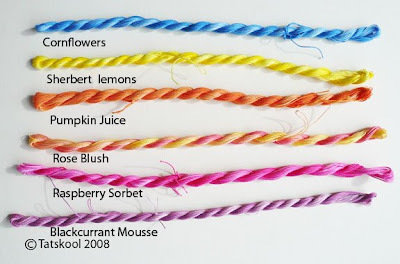 That was until I gave skeins of Pumpkin Juice (you have seen this in Jane's One Pass Edging in my previous post) and the new Rose Blush now renamed Salmon Mousse to my tatting class and the hearts they made are fabulous. They have changed my mind. The colour changes in these two threads are subtle enough not to mask the design. I am beginning to realise that my favorite HDT are going to have subtle colour changes, but there will of course be vibrant multicoloured ones when I decide what to tat with them...geckos of course!! Pumpkin Juice is def one to be repeated. 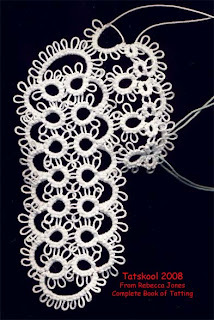 From the first time I saw Shay's blog with it's treasure trove of vintage patterns I was fascinated by the Pattern for a 3D Daisy that she showed. The pattern is by Mrs W.M. Odum and was written in 1929 and I have never seen anything quite like it. Elizabeth's version that I had to try it. Oh my that is so beautiful, absolutley perfect. What a skilled tatter she is. Adding the beads makes such a difference. This is my first attempt, partly to work out how much thread it took before I use my precious threads...tho' I don't think this will be suited to HDT variagateds, and partly to see if I could work out how Elizabeth managed to get her petals that go into the centre and out again without the chains crossing over each other at the top. Tried as many methods as I could think of but wasn't happy. 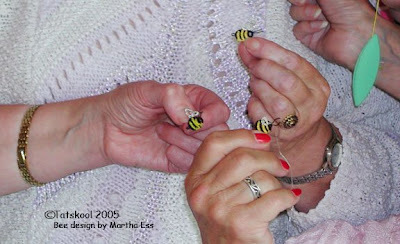 Wally did her petals as rings but no way could I work out how to do that. In desperation I asked Elizabeth how she did it and she very kindly told me and posted it also on her blog comments. I was already part way through my second attempt and since her method involved switching shuttles I didn't have enough thread wound on so did a lot of shoe lace tricking which added bulk to the last round and didn't look as good as it should. I tend to be pulling my chains too tightly making the flower even firmer than it should be so tried to relax my tension a bit. My third attempt not quite as perfect as Elizabeth's but I am more or less happy with it. Wally used two colours, that might be nice to do and maybe smaller ones with less rounds would look good, or maybe smaller threads would make the beads stand out more... but this takes quite a long time to tat and I need to move on to other things that I just HAVE to tat! A lot of you admired the vibrant colour of my orange flower, probably a bit exaggerated in brightening the scan! 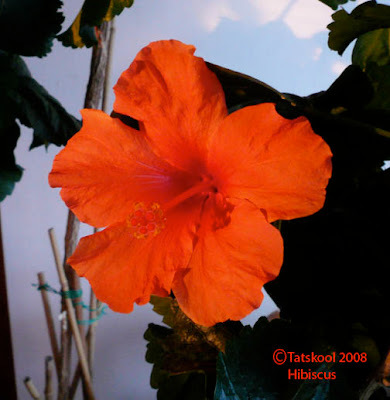 BUT I thought you would like to see the inspiration for my colour choice....my very favorite Hibiscus flower caught with the evening sun shinning in through the window. We have lots of hibiscus's to remind us of tropical days when you could pick a fresh flower every day to wear behind your ear. the flower will keep its turgidity and last for a day as it does on the plant. Wouldn't that just brighten your day? Three nice things in one day, now how often does that happen. Firstly I was sitting at my computer eating my breakfast...as everybody does! 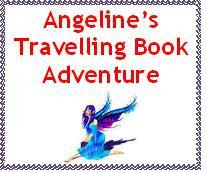 First post that I saw was from Gina telling me that I had won her April draw in her 5th Anniversary year extravaganza. 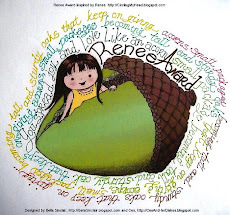 I can now tell you that I have had my fingers so tightly crossed since I put my name in her hat that I was beginning to wonder if I could keep it up for a whole year. I knew that it would be worth it as having a piece of someone else's tatting is worth suffering for...especially when it's from someone as nice as Gina.....there that should have buttered her up enough to make sure I get something spectacular!!!! Well that kept me on top of the world until the postman came and then my cup began to run over....with not one but two items. First to be opened was a little box from Ladyshuttlemaker Sherry Pence. My curiosity had finally got the better of me and I had ordered one of her ceramic shuttles. 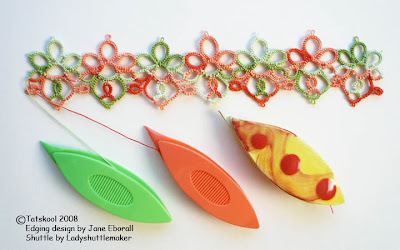 I knew it would look gorgeous but would it work a a tatting shuttle!!! I have played with clay both hand built and on the wheel in a couple of evening classes a long while ago. I was so taken with it that I used to bring lumps of clay home to make more than I could do in a class. I longed to have a kiln of my own. The teacher was so pleased that someone as so keen that she fired all my things and my house is still littered with them...how could I throw them away. 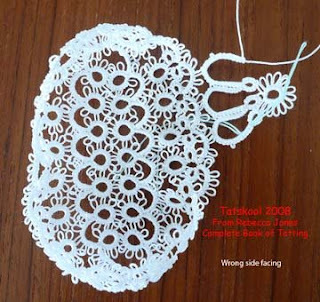 But making a tatting shuttle out of a material that has no spring in it,now that is a challenge indeed. I can now tell you that she has succeeded.....magnificently. 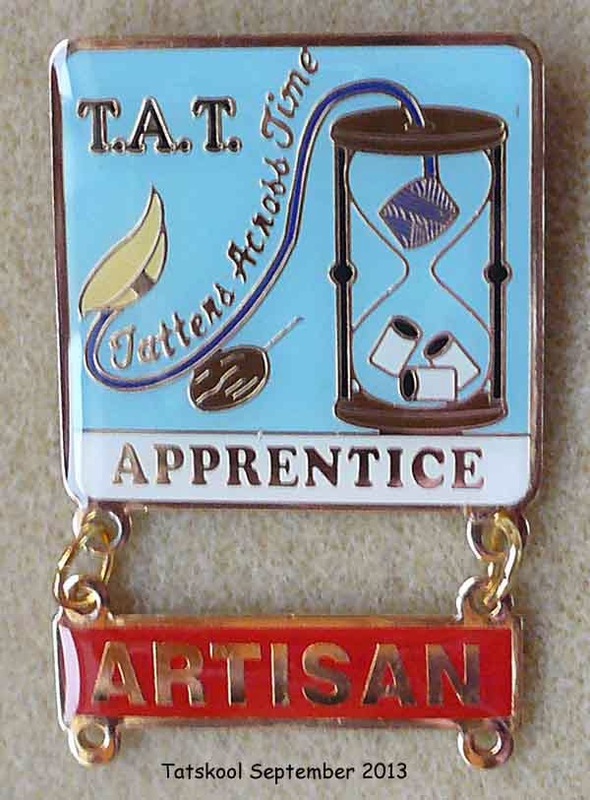 I now have a fully working state of the art, one of a kind, unique tatting shuttle. It even has a pick, all I have to do now is to make sure that I don't drop it!! Don't you just love the matching Clover shuttles!! and now the lovely orangey one from Sherry. 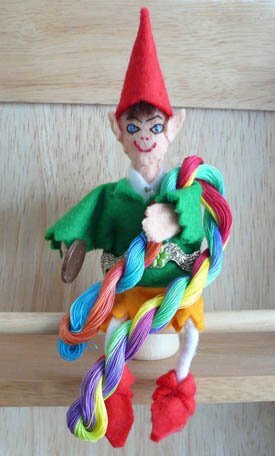 It makes a lovely tinkling sound when you pull the thread through one end. Here is the edging by Jane Eborall made in trial pieces in Flora 10 and Flora 20 and then in my own hand dyed Coats 40. The colours are Pumpkin Juice and Apple Greens....don't you just love being able to name your own colours!! This edging is made in one pass using Jane's continuous thread join and is quite easy once you get the hang of it but does need some concentration with all the rings coming off rings. This is a work in progress..or is it!! So what was the third nice thing you all want to know...don't you?? After looking forward to getting my hands on Martha Ess's new book Holidays on the block...see previous posts for info about it, didn't the book get lost in the post! It must have travelled several times round the world in the month it took to cross the big pond. But hurrah! it's here at last and is well worth the wait. It's a big selection box of non fattening patterns! I can't even begin to decide which are my favorites or which to do first, but I'll let you into a little secret...I have dyed some threads that will be perfect for a bat and an eagle. Martha has dedicated the book to ME!!! Pause while I read it again to make sure it is not some other person with a name similar to mine....nope it really is me! 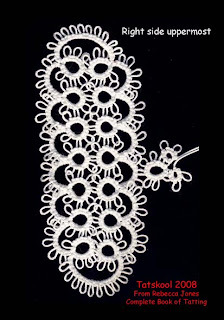 Martha says that it was my enquiry at an opportune moment that led her to start tatting 'block critters'. 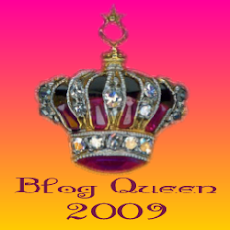 I remember that moment well, it was back in 2005 when I wrote to her to ask if I could teach her block tatted bumble bee to my group. She generously said yes and remarked that she had forgotten all about the little bee. 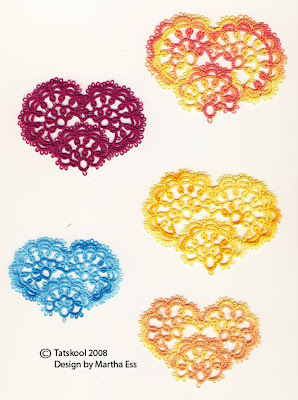 I think this was the first block tatting that we did and it was an instant hit. I often like to send a photo to the designers of what we tat and Martha says that their smiling faces make her day...they make my day too! Can't show you their smiling faces as I haven't asked their permission but I can show you the little critters that they made and were so proud of. It is so nice to think that all those lovely block tatted patterns were spawned from this little enquiry. Thank you so much Martha, I am honoured more than I can say and so pleased to have you as my friend. Thank you for all the great comments about my bootees. It was interesting to see that many people like me find 3D projects daunting. It is hard to see where to start and how the finished item is put together. 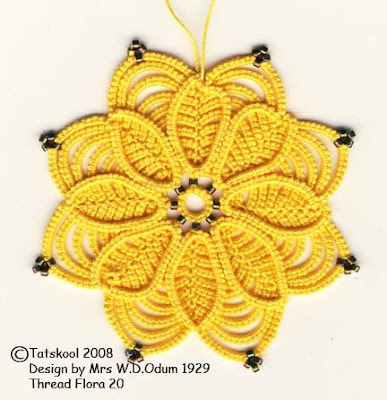 I took a lot of photos of the progression of my work (mistakes and all)to help my tatting group so maybe you would like to see them too. Apologies to those who will find this unnecessary! 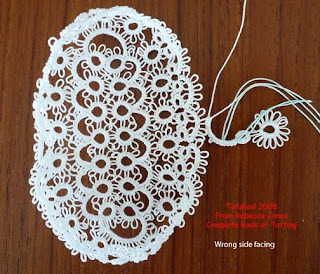 I can't show you the pattern diagram but you can find it on page 94 of Rebecca Jones's The Complete Book of Tatting. Round 1 is very simple just rings and chains! and forms the sole of the shoe. 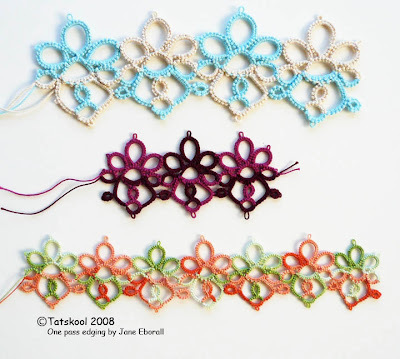 Round 2 is just a simple trefoil and chain edging that you have probably done lots of times before. It is joined on to the previous chain with right sides uppermost, this photo is taken with the underneath of the sole uppermost. When you go round the end of the sole this round will begin to take on a 3D shape you can see it curving away from you in the photo,and you will end with a little boat shape. 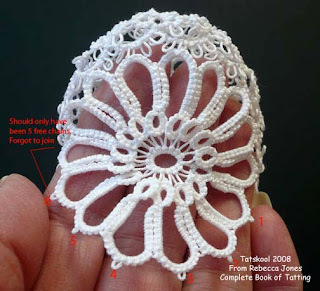 Round 3 consists of a medallion which will form the top of the bootee. This is joined on to the boat shape.Ten of the chains are joined on to the bootee and five float free. Make sure that the free ones are the last ones to tat so that you don't tat yourself into a corner! (the pattern diagram lead me into making this mistake),making it hard to complete the round. The chains are joined with the wrong side uppermost, join the first chain to the 5th chain down from the top of Round 2.
mmm one of my mistakes on this round..forgot to join the chain to the previous round..but this does show you how the round is progressing! bit of untatting to do there! Another mistake that I hadn't noticed.... I have only joined 9 chains to the base instead of 10....I left this photo in as it does show the motif off very well, I love the way the little rings overlap and well nobody's perfect!! Round 3 completed perfect this time! Round 4 is the same as the second round, trefoils and chains, gives a lovely frilly edge to the top of the bootee. The ring is joined right side to right side so this photos taken from underneath the bootee. This shows how Round 4 joins on the the free part of the motif and continues round the top of the bootee. It really did need stiffening as it tended to sag a little and even more when the ribbon was added. This really is the most elegant bootee pattern that I have seen and well worth the effort. After making 5 of them it really is very easy! 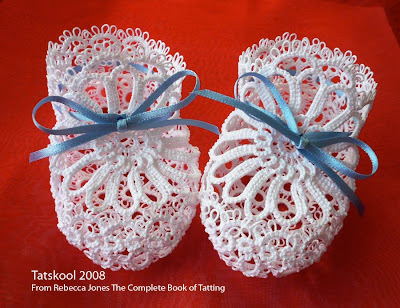 Now tatting baby's bootees is just not my scene! but everything is worth trying ONCE! Took a look at the book (that we all have). The bootee in the photo looked pretty, the diagram looked like a nightmare. Looking at a flatenned bootee is a bit like looking at the world on Mercators projection...hugely distorted! 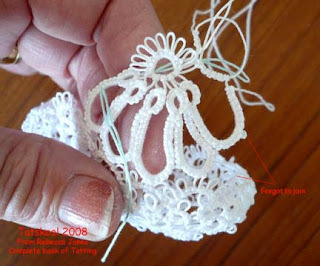 The tatting is actually very easy..only one split ring and for most of it every picot is separated from the next by 2 stitches so that's easy to remember. She says that all picots are normal size so you have to look past the distortion. But what is normal size?? The headache for me was in joining one round to the next as I am very bad at upside down,standing on your head,back to front stuff and the diagram was not a great help. In fact it took me until the third bootee to get it right and amend the diagram so that joining was easy to see. Now I don't have to contort myself to fit my final chains into a tight space and end up having to do unflipped chains to get them in at all. 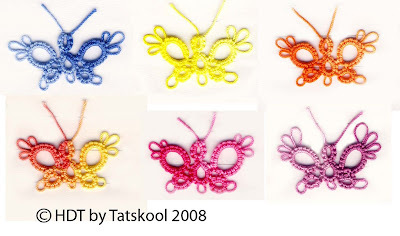 The most important thing to strike me (and it wasn't until I was part way through) was the sudden realisation that the bootee I was tatting bore no resemblence to the photo in the book!! I had expected that the photo would be the bootee that I was making...but no not so! My first trial was in a very light salmon Flora 20 using normal sized picots, it is full of mistakes and missed joins but by the time it was stffened and blocked and had a ribbon threaded through the rings it looks divine. Mmmm normal sized picots...well it seemed to me that a baby's bootee needed to be very very frilly and so my picots became a lot bigger and so did my bootee! I ended up making my trial and then two complete pairs in white Coats Mercer 20......oh you just can't beat white for some things can you. One pair is pretty good and the other is damn nigh perfect..every picot measured, just one little misplaced picot to show that it really is hand made. The longer picots made quite a difference to the finished size. 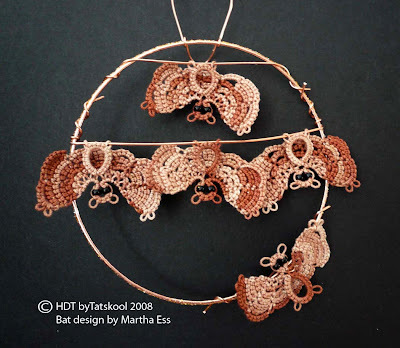 This is to show you how pretty the motif on the front is with it's overlapping rings and long chains. Sorry but I couldn't stop taking photos of this achievement! This is real old fashioned heirloom stuff. 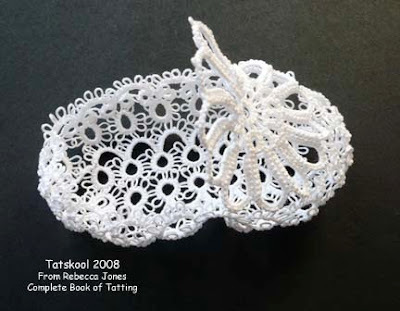 Except that I looked through all my Tatting books and all my archival stuff and could find plenty of bonnets but no bootees until quite recently. Anyone have any comments on this? Don't they send little shudders down your spine! 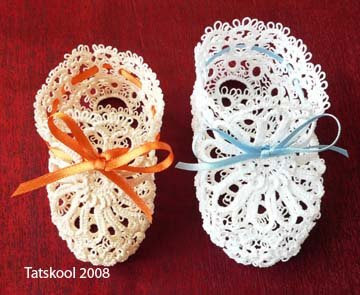 and well there might even be another reason for tatting bootees!!!!!!!!!!! 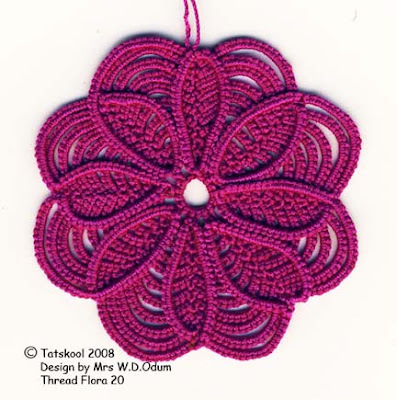 Now to get back to real tatting...in vibrant HDT! nuff of this white stuff.